Evolve 21 is the first inclusive exercise app for people of all abilities. 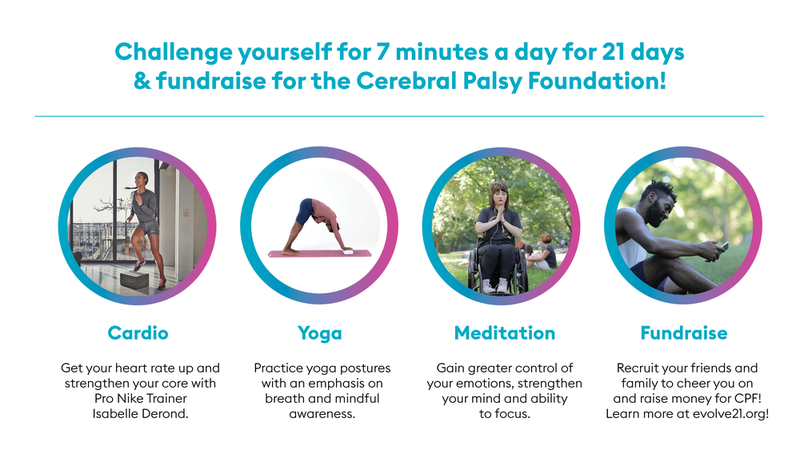 Challenge yourself for 7 minutes a day for 21 days and fundraise for the Cerebral Palsy Foundation. Evolve21's trainers represent individuals with different physical abilities because everyone deserves a personalized wellness routine that works for their body. No two days are the same. Choose your own wellness adventure and navigate between fitness, meditation and yoga routines. Recruit your friends and family to cheer you on and fundraise to change what's possible for people with disabilities! Evolve21 is coming this summer! Join the movement today.